In response to the ridiculous insinuations made by some (including even high ranking officials in the Church) that ad orientem worship is somehow only a part of the Traditional Latin Mass or “extraordinary form” and that re-introducing this in the new Mass would therefore be some unjust “mixing of the forms,” we stress that neither the Second Vatican Council, nor any Pope, nor any official mandate from the Church has ever directed the priest to face the people during the whole of the celebration of the Sacred Liturgy. On the other hand, the rubrics of the Missal and the directions of the GIRM many times presuppose that the new Mass would be celebrated ad orientem. Facing with the people is not something which belongs only to the Traditional Latin Mass, it is also a legitimate part of the Mass of the Second Vatican Council. In no way should ad orientem be thought of as “going back” or “pre-Vatican II” – this is simply the normal way that the Church presupposed the new Mass would be celebrated, as is indicated by the rubrics and directives in the GIRM. The GIRM does not always indicate which way the priest should be facing. The clearest indications are found at the “Orate fratres” (the “pray, brethren” before the prayer over the gifts) and at the communion rite. In these places, the priest is specifically directed to turn and face the people at certain moments, and then to turn to face the altar at others. We also note that, in the opening rites of the Mass, the priest is directed to face the people for the sign of the Cross and the greeting, but nothing further is said. Following the Church's tradition and her perennial liturgical practice, it would be safe to assume that the priest is always meant to be facing towards the altar “ad orientem” excepting for those places in which he is expressly directed to face the people. This is the most natural way to read the GIRM, since the indication to face the people is given as a change in direction -- the priest had been facing towards the altar, towards the front of the church, UNTIL he was directed to turn and face towards the people. 1) In the entrance rites, the procession to the altar has directed the priest in a forward movement -- he clearly approaches the sanctuary facing forward, towards the altar and towards the front of the church. The priest only faces towards the people at that moment when the GIRM directs a change in momentum as he faces the people to make the sign of the Cross. In the entrance rites, the priest is facing ad orientem, except when the GIRM indicates otherwise. 2) At the offertory it is presumed by the GIRM that the priest is facing ad orientem until he is directed to turn and face the people as he says, “Orate fratres” ("pray, brethren”). He then returns to facing toward the altar and towards the front of the church for the Eucharistic prayer. When the GIRM and the Missal give no clear indication of which way the priest is to face, it is presumed that he should be facing ad orientem with the people towards the Lord. Pope Emeritus Benedict XVI indicates that ad orientem is fitting for those portions of the Mass in which the priest addresses God directly. Cardinal Sarah stresses this same point as he states that the priest should face ad orientem not only for the Eucharistic Prayer but also for the Gloria and the Creed. The basic lesson from these two figures of the Church's Magisterium is that those words which are directed to God should be accompanied by a posture which is likewise directed towards God - ad orientem. After processing to and reverencing the altar, before making the sign of the Cross, the priest faces the people. He continues to face the people for the greeting "The Lord be with you" and the opening of the penitential rite "Fratres, agnoscamus" ("Brethren, let us acknowledge our sins"). Prior to the Confiteor (“I confess”) the priest turns ad orientem, turning slightly to the right and the left when addressing the people "et vobis/vos, fratres" ("and you, my brothers and sisters"). He remains facing forward ad orientem for the prayer “Misereator nostri” (“May almighty God have mercy on us”). At the Kyrie, the priest continues to face the front of the church. He remains facing ad orientem through the Gloria (if it is said/sung). The priest says “Oremus” ("Let us pray”) and the opening prayer all while facing with the people towards the front of the church. He is then seated. Note for the Liturgy of the Word: If proclaiming the Gospel, the priest makes his preparatory prayer facing ad orientem in front of and toward the altar. The Liturgy of the Word being completed, the priest faces ad orientem as the Creed is said/sung (if the Mass has a Creed). Facing toward the people, the priest introduces the general intercessions when they are used. He faces ad orientem for their concluding prayer. Ascending the altar and remaining on the “people’s side” (i.e. not walking around to the far side of the altar if it be free standing, but ascending facing with the people towards the front of the church), the priest faces ad orientem throughout the offertory rites (excepting if he receives the gifts) until the “Orate, fratres” (“pray, brethren”) when he faces the people also for their response “Suscipiat Dominus” (“May the Lord accept the sacrifice at your hands”), and turns again ad orientem towards the altar as he says the prayer over the gifts. NOTE: This turn is a full circle turn, the priest has turned around to his right to face the people for “Orate, fratres” and then continues the turn all the way around 360 degrees after the “Suscipiat”. The priest remains ad orientem throughout the whole of the preface dialogue and the Eucharistic Prayer, as is clear from the GIRM which gives no indication that he should turn to face the people after expressly directing him to face the altar for the prayer over the gifts. After the Lord’s Prayer and embolism as well as the prayer “Domine Iesu Christe, qui dixisti” (“Lord Jesus Christ, who said to your Apostles”), the priest faces the people as he gives the peace saying, “Pax Domini” (“The Peace of the Lord be with you always”). He then returns to ad orientem for the fracturing rite – note that this turn (following the tradition of the Chruch) would not be a full circle, but a turn back to the left to face the altar so as to avoid ever turning fully away from the Eucharstic Lord. After the Agnus Dei (“Lamb of God”), the priest holding the Host faces the people saying, “Ecce Agnus Dei” (“Behold the Lamb of God”) and then returns to facing the altar to consume the Host. After the completion of the Communion Rite, the priest turns to face the people as he says “Oremus” (“Let us pray”), and then he turns again toward the front of the church ad orientem as he says the post Communion prayer. Facing the people, the priest says “Dominus vobiscum” (“The Lord be with you”) and gives the final blessing. Still facing the people, the priest says, “Ite, Missa est” (“Go forth, the Mass is ended”). He then turns ad orientem to reverence the altar before the recessional. When does the priest face the people? For the sake of ease, we list below those times when the priest faces towards the people when celebrating Mass ad orientem. When he makes the sign of the Cross and through the opening dialogue (including "Brethren, let us acknowledge our sins"), until prior to the Confiteor ("I confess") or penitential rite. When inviting the people to pray the post Communion prayer as he says, "Oremus" ("Let us pray") -- but note that the prayer itself is said, ad orientem. For the final blessing and dismissal. For the entrance rites, GIRM 124-127. For the Creed, GIRM 137-138. For the Offertory, GIRM 146. For the Communion Rite, GIRM 154, 157, 158, 165. For the concluding rites, GIRM 167. The basic answer is, no, deacons generally do not face the people when the priest does. They would only face the people when addressing them (e.g. "Go forth the Mass is ended"). The deacon does face in the direction of the people at the "Behold the Lamb of God", but really he is facing towards the Host which the priest is holding (hence, towards the people, but turned somewhat inward towards the priest and the Host). It is worth noting that the deacon would turn somewhat towards the priest to receive the final blessing as well. The most noticeable times when the priest turns to the people while the deacon remains ad orientem would be those times at the altar - I am thinking especially of "Pray, brethren" and also "The Peace of the Lord be with you always." If there is a deacon, Father, wouldn't he turn to the people with the priest for "The peace of the Lord..." if he (the deacon) is to say, "Let us offer each other the sign of peace."? Chatto, If the peace is offered among the people, after the priest says "the peace of the Lord" he turns back ad orientem, and the deacon faces the people then and says, "let us offer..." ... Thanks for pointing that out! Thank you for taking the time to lay this out. I would kindly disputed two points. With Cdl. Sarah, I would say it is more fitting during the penitential rite, following the instruction 'brethren let us acknowledge our sins...' to turn towards the altar for the prayers that follow, as is done in the traditional rites for the confiteor. Second, I do not think it advisable turn turn to the altar clockwise after the dismissal. This is done in the traditional rite because the priest proceeds to the gospel side for the last gospel. As this is omitted in the newer rites, it seems advisable to turn back to the left as at the other instances of greeting and turning back to the altar. Points, to be sure, where the instructions are silent, and on which we may legitimately differ, but I believe in such cases its best to be guided by historical practice. You may be correct about the confiteor - certainly, the priest would face ad orientem for the other options of the penitential rite. One point is that the confiteor is clearly addressed to the people (I mean, it is spoken to the people), and this would seem to indicate facing the people ... but you may be correct that it would be better to follow the more ancient practice! As far as the full turn after the "Ite, Missa Est" -- I could be wrong, but as I recall the priest does make the full circle after the blessing even when there is not a last Gospel (as, for example, on Christmas Mass of the day). GIRM 124 states: "Once all this has been done, the priest goes to the chair. When the Entrance chant is concluded, with everybody standing, the Priest and faithful sign themselves with the Sign of the Cross. The Priest says: In nomine Patris et Filii et Spiritus Sancti (In the name of the Father, and of the Son, and of the Holy Spirit). The people answer, Amen. THEN, facing the people and extending his hands, the Priest greets the people, using one of the formulas indicated. The Priest himself or some other minister may also very briefly introduce the faithful to the Mass of the day." I read this to mean the priest faces the people AFTER making the Sign of the Cross. Would that be correct? As the confiteor (new version) begins 'I confess to Almighty God' and addresses the Angels and saints, from the chair, I face North (sedelia facing the North along the South side of the sanctuary) and turn slightly to the people at the words 'and you my brothers and sisters'. At daily Mass, or in the chapel, I face the altar at the confiteor and turn slightly to the people at the words above. As for the direction after the blessing and dismissal, I can't find any particular instruction in the EF missals I have or the few commentaries that address to situation of the omitted last gospel. I still think proceededing to the right seems amiss when not moving to the gospel side, but admittedly only have the notion that the full revolution is the exception to the general rule of not putting one's back to the altar. I'd love to hear from someone with better access to resources than me. Father, Thank you for this explanation. In many other articles that I have read, the authors didn't explain the whats and whys of Ad Orientem. Your brief article is full of great insights for this Post Vatican II Catholic. Also, the comments have been very intelligent, respectful and kind unlike the comments on the aforementioned articles. It’s interesting to note that in both the 1969 ‘Ordinary Form’ as well as the traditional pre-Vatican II form, the priest does NOT face the people for the dialogue that begins the preface: “The Lord be with you…Lift up your hearts”, etc. This is because, even though addressing the people, the priest now has entered the “liturgical holy of holies” and dare not turn his back to the altar. Thus it is curious that the 1969 Mass departs from this ancient practice by specifically instructing the priest to turn towards the people for “The Peace of the Lord be with you always”. The fact that the ancient practice is NOT to face the people even for for the “pax” explains how it was possible for the ‘fractio panis’ eventually to migrate from the Agnus Dei to the “Pax Domini”. One of the very FEW parts of the 1969 rite that actually can be considered a “restoration” rather than an “innovation”—despite Vatican II’s warning that “there must be no innovations unless the good of the Church genuinely and certainly requires them”*—is that the 1969 Mass puts the fraction in its original location: during the Agnus Dei. I did not go into the details in the article, but you have noticed a slight confusion between the GIRM and the rubrics printed in the Missal itself. The rubrics in the Missal specifically indicate that the sign of the Cross is made facing the people (although this is not so clear from the GIRM). "When the Entrance Chant is concluded, the Priest and the faithful, standing, sign themselves with the Sign of the Cross, while the Priest, facing the people, says: In the Name of the Father, and of the Son, and of the Holy Spirit." Having looked into the matter more carefully, it indeed seems that the priest would not complete the circle in the Traditional Mass when there was no last Gospel. Hence, I will modify that portion of the post accordingly - thank you for the insight! I also agree that it would perhaps be more fitting to face ad orientem for the confiteor, especially given the indications from Cardinal Sarah. When the Deacon Chants or reads the Gospel, will he face the people, yes? How does one position the priest's chair in an ad orientem Mass? Given that the GIRM anticipates the Introductory Rites and the Collect being said while the priest stands at the chair, I presume he turns ad orientem while standing in that position? @ Brother Paul: General Instruction of the Roman Missal [GIRM] No. 310 states that “the more suitable place for the chair is facing the people at the head of the sanctuary, unless…the tabernacle were to be positioned in the center behind the altar. In any case, any appearance of a throne is to be avoided.” Like GIRM No. 299 and its description of the altar, this description of the chair is taken directly from ‘Inter Oecumenici’, September 26, 1964, no. 92. We already can see in this instruction the mischief that Msgr. Annibale Bugnini was up to—because the Council itself made NO mention of the altar or of the priest’s “chair”. It is important to note what precedes this, i.e. No. 90 “In building new churches or restoring and adapting old ones…”. Yet there NEVER was a decree ordering that all existing church structures must undergo any changes whatsoever. So, if we were to look at long-standing tradition—rather than Bugnini’s radical meddling—the priest would stand or sit at a sedilia on the right (“liturgical South”) side of the sanctuary. This is how it is done for both the ‘Ordinary Form’ as well as ‘Extraordinary Form’ Masses at my own parish. In the ‘Ordinary Form’ this arrangement makes it a rather simple matter for the priest to turn slightly towards the people at the very beginning of Mass, then turn slightly towards the altar for the Penitential Rite, etc. Much of the current liturgical mess is the result of an erroneous understanding of the ancient layout of the early Roman basilicas. They are constructed “backwards”, i.e. with the altar in the West end. The original practice was for the people, at the “sursum corda”, to turn THEIR backs to the priest and face the open doors in the East end of the basilica. Thus, all would be facing the rising sun streaming into the doors, representing the final coming of Christ: “For as lightning that comes from the east is visible even in the west, so will be the coming of the Son of Man.” (Matthew 24:27). The awkwardness of this arrangement never caught on elsewhere, the more common arrangement being for the altar to be placed in the East end, so only the priest had to turn. Much more detail about this can be found in “The Reform of the Roman Liturgy: Its Problems and Background” by Msgr. Klaus Gamber; English edition, with preface by Jos. Cardinal Ratzinger (later Pope Benedict), published in 1993. GIRM 86: "The priest then goes to the chair. After the entrance song, and with all standing, the priest and the faithful make the sign of the cross. The priest says: "In the name of the Father, and of the Son, and of the Holy Spirit;" the people answer: "Amen." THEN, facing the people and with hands outstretched, the priest greets all present, using one of the formularies indicated. He or some other qualified minister may give the faithful a very brief introduction to the Mass of the day." "After the entrance song, the priest and the faithful remain standing and make the sign of the cross: In the name of the Father, and of the Son, and of the Holy Spirit. 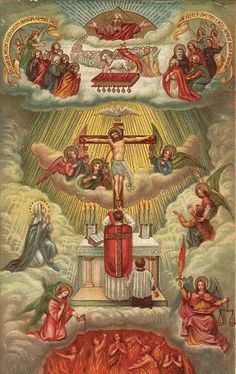 THEN the priest, facing the people, extends his hands and greets all present with one of the following greeting..."
My first experiences with Masses celebrated ad orientem had the priest facing the altar for the Sign of the Cross then facing the people for the greeting. This is what I did when I was ordained a priest and began to celebrate Mass ad orientem myself. I was left confused when the third edition came out because of the apparent discrepancy between what GIRM 124 states and the rubric in the Order of Mass. So, then, I should be facing the people for the Sign of the Cross from now on? Fr G, It appears that, yes, technically the sign of the Cross should be made facing the people ... Though it is difficult to be sure what is truly the intent of the Church (given the ambiguity in the GIRM and the rubrics). Personally, I do face the people for the sign of the Cross. The difficulty of saying Mass ad orientem is the nature of the NO itself. I have been a priest over 35 years, and say the traditional latin Mass on sunday, (I have 6 masses in my parish) and twice in the week. I tried for many years to 'pretend' that the new was simply an modern expression of the old, but it's not. The new Mass I feel demands an engagement of personality with the faithful.the best I can do from time to time is offer the Canon facing the altar. The temptation to lose hope is a real danger, don't give in! We simply must not abandon the tradition when sayinf the Novus Ordo - as your brother priest, I heartily encourage you to offer Mass ad orientem as the norm, to simply do so at random moments is extremely harmful to the Liturgy and the faithful. Follow Sarah and Benedict - make the switch. Thank you for this. It is so clearly written that even the most blind should be able to see.